UPDATE: Samsung's iOS apps for Gear S2 and S3 smartwatches and the Gear Fit 2 should now be available on the App Store in any territory where the devices are sold. You can find the links to each app in the updated story below. Originally slated to arrive a year ago, Digital Trends is reporting that iPhone compatibility is finally here for Samsung’s range of Gear devices with the release of two official Samsung Gear apps on Apple’s App Store. 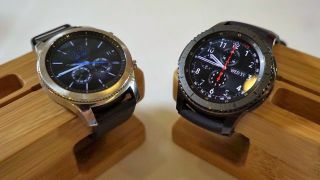 The first app, Samsung Gear S, allow users to easily sync their iPhone to either a Gear S2 or Gear S3, while the separate Samsung Gear Fit app will let users connect a Gear Fit 2 fitness tracker. The Gear devices won’t be compatible with every iPhone model, though – in order for this to work, you’ll need an iPhone 5 or above, running at least iOS 9.0. The Gear S3 Classic and its rugged counterpart, the Gear S3 Frontier, were released late last year and have been quite well received, making them more than suitable for iPhone users looking for round-faced alternatives to the rectangular Apple Watch.